Stepping Stone Kits make it easy to capture a memory in stone. The DIY kits include everything you need, and the process is so simple. 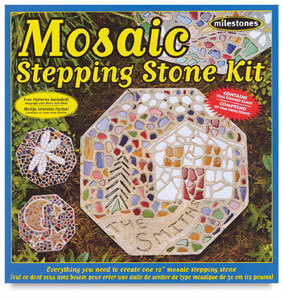 Just mix, pour, and then decorate your stepping stone with real stained glass mosaic pieces, pretty pebbles, stamps, writing, and more. 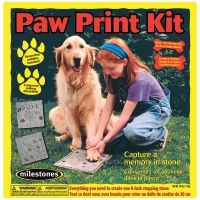 Paw Print Kit — Celebrate a favorite pet with a custom stepping stone keepsake. This kit includes 3.5 lb of stepping stone mix, an 8" reusable plastic mold, 4 oz of decorative Roan River pebbles, a bone-shaped stamp, a wooden mixing paddle, a writing tool, and easy-to-follow instructions. 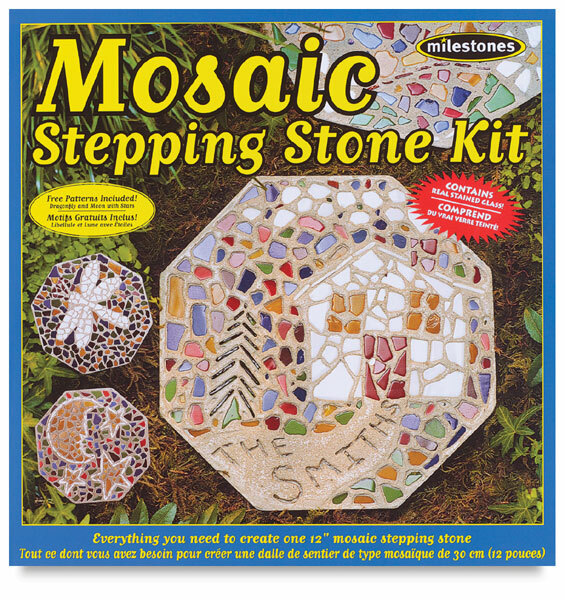 Mosaic Kit — This kit includes 7 lb of stepping stone mix, a 12" reusable plastic mold, 1 lb of mosaic pieces, a wooden mixing paddle, a writing tool, instructions, patterns, and design ideas. ® Milestones is a registered trademark.